Images - That Thing You Do! Tom Hanks Makes His Directorial Debut With That Thing You Do! The official Web site for That Thing You Do! When Tom Hanks saw the Compleat Beatles’ documentary he was fascinated to learn that the band had replaced Ringo (who was ill) when they toured Japan and Australia. He wondered what life was like for the replacement drummer during those three weeks on the road. And then he remembered the one-hit wonder bands of the sixties, bands who hit the spot light with one big hit and then disappeared. He merged these two ideas together for his directing debut, That Thing You Do!, a funny and nostalgic look at a small time band that changes drummers and suddenly hits the big time. Tom Everett Scott plays Guy Patterson, a salesman at his father’s appliance store in Erie, Pennsylvania, circa 1964. During the day, he extolls the virtues of refrigerators and transistor radios to the store’s customers, but at night, after he locks the doors and does the bookkeeping, he sneaks into the basement and beats the tar out of his drum kit while listening to jazz records. His friends have a rock band, and when their drummer breaks his arm, they ask Guy to fill in. Faye (Liv Tyler) and Jimmy (Johnathon Schaech) relax between shows in That Thing You Do! At a local talent show, the "One-ders" take the stage (always mispronouced the O-NEE-ders). While Guy gooses the rhythm and Jimmy (the band’s singer and songwriter) shouts "Slow down!" the band launches into "That Thing You Do!" The crowd goes crazy. 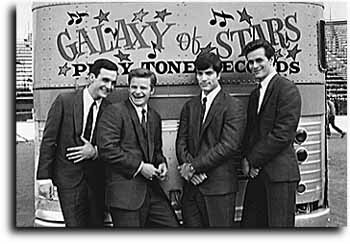 Just a few weeks later, with a major record label touting the song, the band (now named The Wonders) watches as their hit single soars up the charts. Much of the success of That Thing You Do! comes from their catchy hit song, which we hear five or more times in the movie. Penned by 28-year-old New Yorker Adam Schlesinger, "That Thing You Do!" is a genuinely catchy tune that perfectly evokes the mid-sixties. It sounds like it definitely could have been a hit and helps make the whole story plausible. The Wonders take to the road as part of Play-Tone Records Galaxy of Stars. But the movie is much more than just one catchy song. Hanks gives us a band that we can really care about. We see Guy in the sterile environment of the appliance store, showing customers washing machines and vacuums, and we long for him to breakaway. But at the same time, the movie doesn’t go gunning for any easy targets. For example, Guy’s father (in a wonderful performance by Holmes Osborne) might be strict and expect his son to follow in his footsteps, but he isn’t a tyrant. He might rant and groan about the low prices at Tele-Mart, his big time competitor, but he’s still a genuinely loving father. The band members are a bemused bunch, totally surprised by their instant fame and never completely shaking a sort of "gee-whiz" attitude to everything they see. Johnathon Schaech plays Jimmy, the band’s leader. And Liv Tyler plays Faye, his girlfriend, in a wonderful, girl-next-door performance. Steve Zahn plays the band’s goofy guitar player. And Ethan Embry plays the always out-of-it bass player. We see them as they go crazy when their song first gets played on the radio, and we see them as their manager, Mr. White (Tom Hanks), barks out orders, "Any questions? Don’t ask." In the process, the band members become our close friends. We cheer their successes and moan at their failures. That Thing You Do! is a sweet-spirited, loving look at the past, gently crafted by Hanks. He clearly likes the characters he created and wants us to like them also. In addition, Hanks gives an excellent performance as the band’s stern manager that’s nothing like anything he’s ever done before. At times the drama becomes a shade too predictable, with the camera keying us to important moments and robbing the story of subtleties, but even with its shortcomings, That Thing You Do! is a joy to watch and gives great hope for Hanks' career behind the camera.